A few weeks ago now, Mike Ellis from Thirty8 Digital presented at Show Us Your Assets – “Just Because Your Objects Are Online Doesn’t Make It Interesting”. The slides are above. Mike suggested 10 good habits for museums to get into when it comes down to thinking, showcasing and engaging with online collections. I always like Mike’s presentations because there are always handy lists and graphs. Two of my favourite things. Whether you love or hate Google, it is the main search engine that the visiting public use to access museum content. Ultimately on the web, visibility is authority. Mike’s provocation was that if museum objects can’t be found on Google, they are invisible to the world. Going on to suggest if museum objects are invisible then there is no point in them being online. This produced lots of discussion on Twitter about how true this is – I’m a little bit on the fence. Mike discussed SEO (Search Engine Optimisation) and provided details of a handy SEO starter guide. Let museum objects be the engines of socially networked experiences. The hook around which conversations happen. Sociable objects online are those that allow users to easily interact with them and with other people. Mike also advocated for objects having a clear call to action. Digital is iterative, be continuously thinking about what and who your online collection is for, and how you measure success. Stories should be drillable. Build a environment where museum object stories can evolve. Unfortuantely technologies can’t be second guessed, but don’t be afraid to ask about formats, costs, standards and risks. Also ask for help when you need it. Mike discussed the MCG email list as a good place to go to for help and support. Measure everything you can. Some questions that museums should be able to answer. What do people do with your objects? Which is the most popular? and why? There is a disconnect between what audiences and museums and funders want. Museums & funders want a large quantity of object records online, whereas users want high quality object records with pictures. I ran out of brain space for points 9 & 10 but the slides can do the talking for me. For the past while Jane Audas and I have been working on a project for Museum Development North East called Engage + Digital. The overall aim of Engage + Digital being to support North East Museums to create dynamic, appropriate and achievable digital engagement strategies. We’ve been working with three museums: Bailiffgate Museum, Bede’s World and Killhope Lead Mining Museum. The focus is on improving access to each museum collection predominately using social media and by providing practical support, evaluating current initiatives, identifying opportunities for engagement, and embedding learning. But we are also have been doing a range of workshops for the wider North East museum sector, culminating with Show Us Your Assets at MIMA (Middlesbrough Institute of Modern Art). There is a lot written about digital activity and social media in museums and how it might help museums become more participatory and engaging for visitors. But when it comes down to it there’s nothing quite like hearing from some passionate people who enthuse about the opportunities digital engagement offers. Show Us Your Assets focused on a range of inspiring case studies to get museums thinking about how digital can be used more effectively to open up collections and how to connect with audiences in new ways. 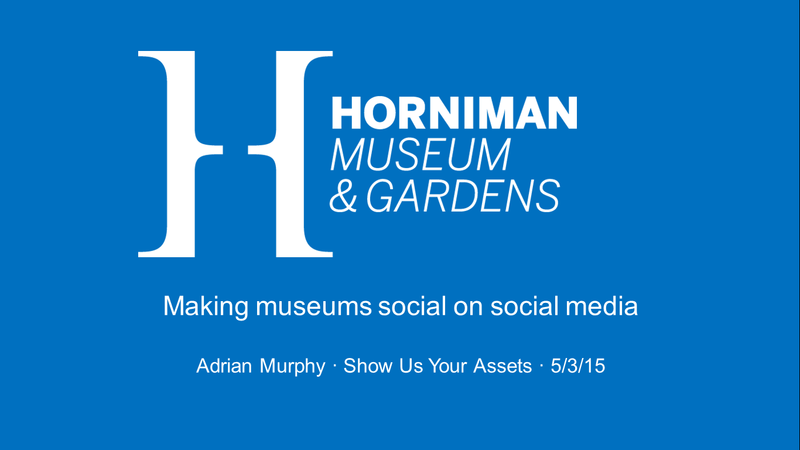 This post looks at the first presentation from Show Us Your Assets, by Adrian Murphy, Digital and Marketing Manager at Horniman Museum and Gardens entitled Making Museums Social on Social Media. What is fantastic about the Horniman Museum is that they are not afraid to try new tools and technologies to see what works and what doesn’t. The Horniman has been continuously experimenting with their digital initiatives, the museum lets the audience discover and explore its collections, in a range of ways (have a look at twitter, facebook, instagram, pinterest, flickr, tumblr for a few examples). They are very good at visually storytelling and encouraging the curious. When using social media they keep these two things at the forefront. Most of the discussion was around the Horniman’s Twitter activity. Adrian advocated for using normal language in tweets, believing it’s important to sound like a real person not a robot. The way you write and the tone of voice is important. The Horniman aim to try to write with a tone that is not necessarily a ‘marketing tone’. But something that is friendly, human, and interested in people’s opinions. For example, on Twitter they ask a lot of questions to their followers. But they style of question are ones that can actually be answered easily. Making it too hard can put people off. Additionally throughout Adrian’s examples of tweets, there were lots of compelling images. Highlighting that visual posts are very important. It’s not all about text. To coincide with one of the Horniman’s exhibitions, Extremes which explored what it takes for animals and plants to survive in some of the most hostile environments on Earth. The Horniman decided to challenge their Deputy Keeper of Natural History to become a #ExtremeCurator by making him venture into cold, heat, darkness and oxygen deprivation. They captured all the #ExtremeCurator action and shared widely on different social media platforms giving the audience a first-hand look at the effects on the human body. This is an excellent example of being playful and informative about a forthcoming exhibition without broadcasting static marketing content. Adrian gave a range of examples of how they highlight the Horniman’s varied collections. As part of a large project to review their anthropology collections, they started an account on Tumblr 2012. The site is updated by staff working directly on the collections review, not only making visible a previously hidden process but also opened their content to a new, wider audience. Tumblr provided an channel for staff to share their enthusiasm for the Horniman collection by highlighting when they found something interesting, fascinating or unusual. Adrian talked about a couple of the fascinating finds which have been featured on tumblr including a small horse made of cheese from Poland and a vulture skull in a leather glove worn as a charm. Adrian discussed that by focusing on the unusual and unique objects in the collection it is a great way to enthuse, intrigue and fascinate others by sharing staff enthusiasm, excitement and wonder about their museum collections. Tumblr in particular is working really not only because it’s a platform that likes lots of visual content but also because Tumblr users like to find out something unusual and unexpected. The Horniman’s collection is full of the unusual and unexpected. Last year whilst curating the temporary Digital Frontiers exhibition in the brilliant Octagon gallery at UCL, both myself and Nick Booth (UCL curator of the science and engineering collections) became a bit obsessed with light bulbs. From this slightly odd obsession, and thanks to a kind research grant from the Institute of Making, Nick and I get to play with light bulbs and call it research. 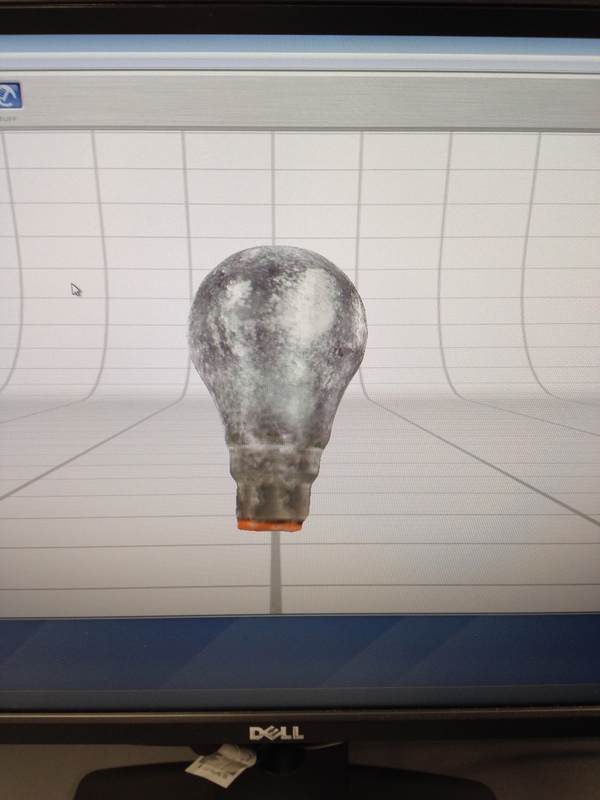 We’re looking at the process of materials and making using 3D scanning and printing to see if creating new objects encourages a closer inspection and deeper understanding of historical objects – in our case light bulbs. Neither Nick nor I claim to experts in 3D scanning museum objects, we wanted to see what we could do with the bare minimum of training on the devices. 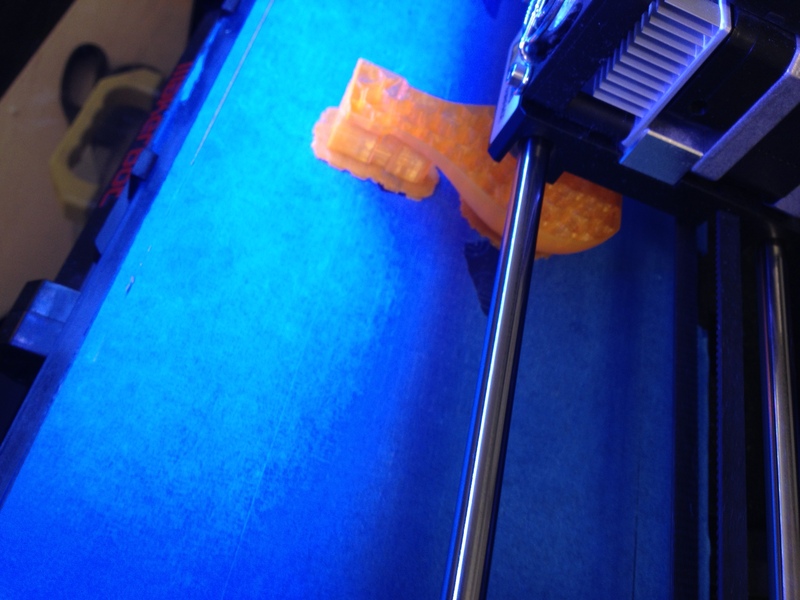 How easy is it for a relatively normal person to scan and print museum objects. 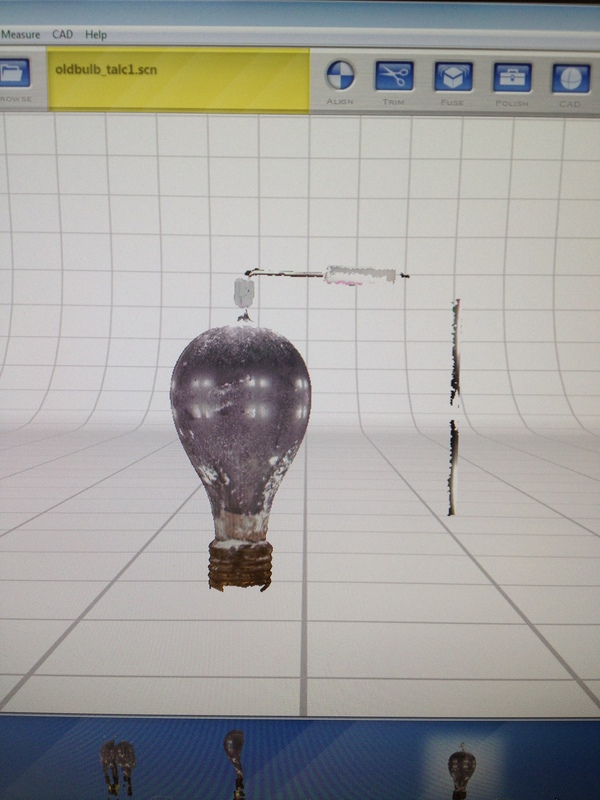 Firstly we played with 3D scanning. 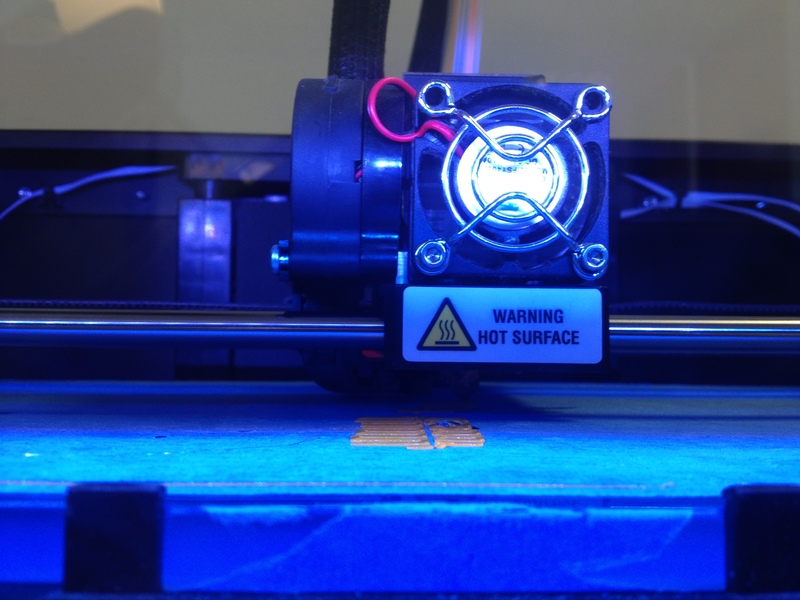 In the next blog post I’ll talk about the process of 3D printing. 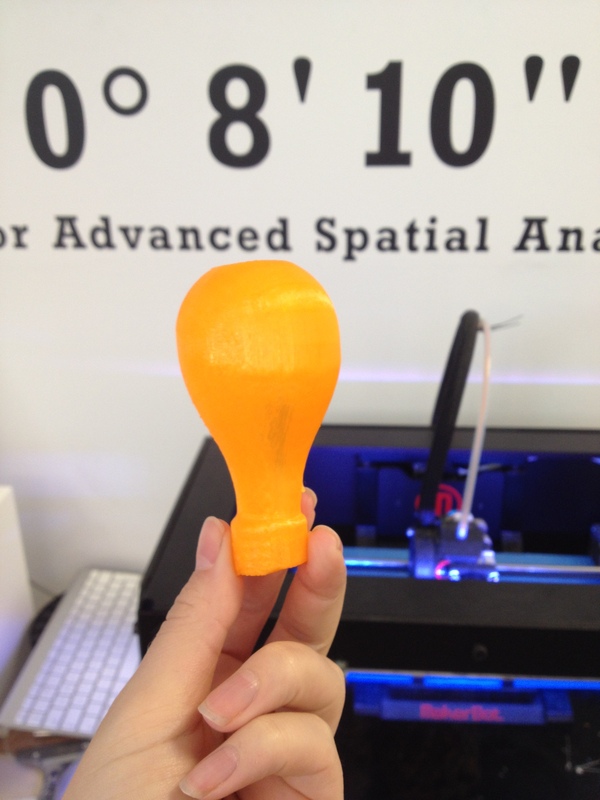 We wanted to look at different ways we could scan and create a 3D mesh of a light bulb. We have tried two main ways of scanning, firstly using easily accessible and relatively cheap (in this case free) technology using 123D Catch and then having a go with a NextEngine. 123D Catch is a free application from Autodesk that enables you to take a series of photos and turn them into 3D models. We used the handy iPhone app. It works by taking multiple digital photos that have been shot around a stationary object and then submitting those photos to a cloud based server for processing. The images are then stitched together to produce a 3D model. 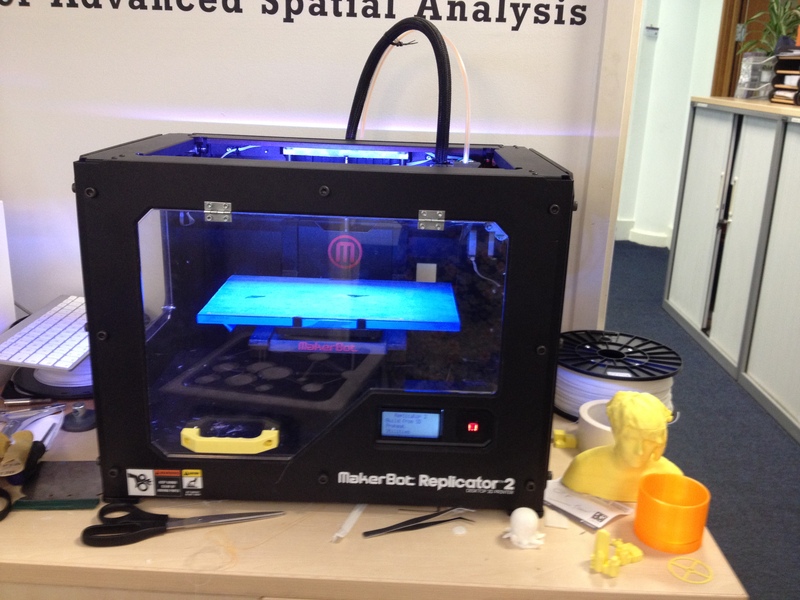 NextEngine is a desktop 3D scanner which captures 3D objects in full colour with multi-laser precision. We knew a light bulb wasn’t going to be easy to scan because scanners don’t tend to like transparent, shiny or mirrored objects. But we thought we’d have a go anyway. 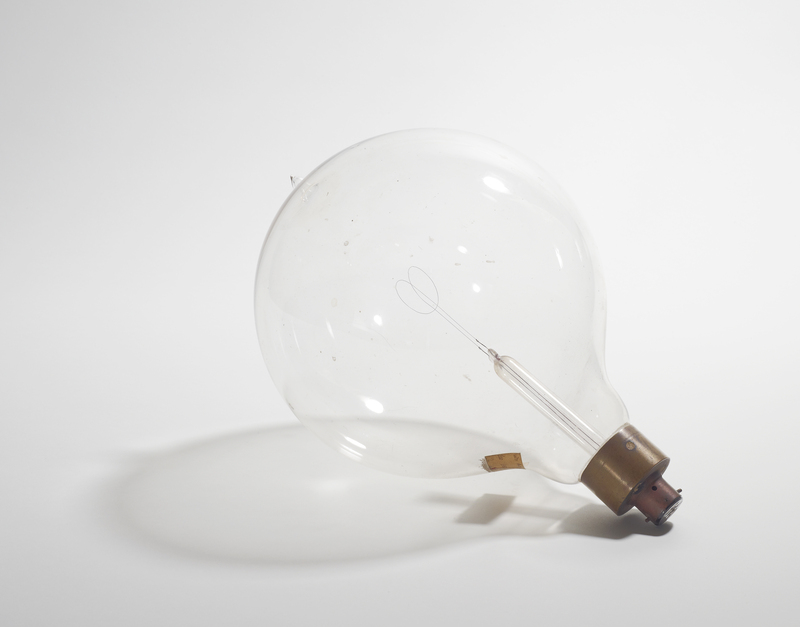 Before we experimented with some of the historical science and engineering collection, we used a normal every day bulb to see what worked and didn’t. As you can see the fitting shows up pretty well, but the glass bulb itself really doesn’t work. 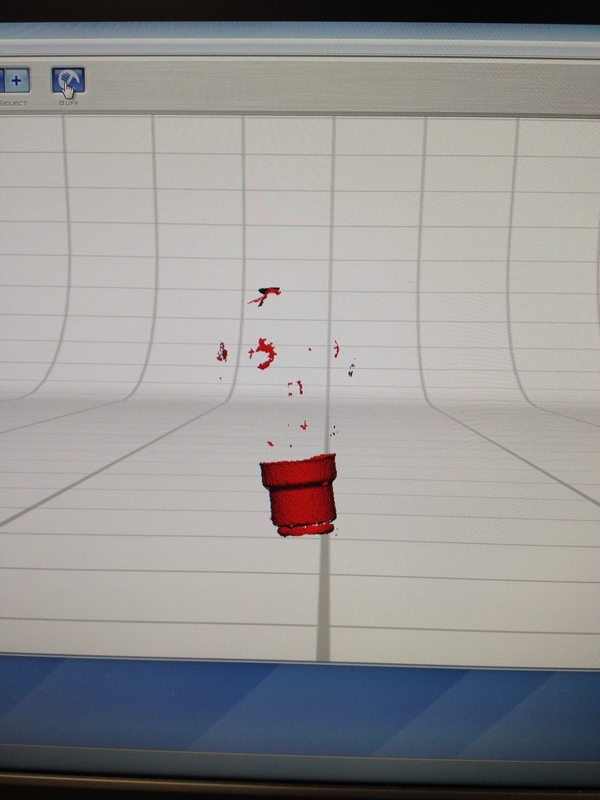 And 123D Catch has gone completely funny. So after a bit of googling, tweeting and advice from the 3D pros at UCL we decided to try and disguise the transparency with talcum powder. So here are the versions with talc. The NextEngine scan is pretty good. It doesn’t quite capture the peak at the top of the bulb, but it isn’t a bad representation. 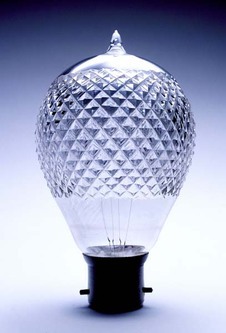 I don’t think we can quite call it a replica but it definitely looks like a lightbulb. Obviously covering a hisitorical object in talc throws a lot of questions up about how museums could utilise 3D scanning if they have to cover delicate and fragile glass objects in powder to get a adequate scan. We’d be really interested to hear if anyone has found a more conservation friendly way of dealing with transparent objects without having to coat them in talc. It also brings up questions about how accurate 3D representations of museum objects should be. Should they be identical? Or is an approximate object acceptable? It’s been quiet on the blog front for some time, mostly due to the small matter of finishing my PhD. On Friday the 20th June 2014 I successfully completed my PhD viva and I can happily say that I passed with minor corrections! It’s going to be a while yet before my thesis is available online, and there are far too many thankyou’s to fit into a tweet. So I thought I would share the acknowledgements section of my thesis. Over the long course of completing this thesis, many people contributed to this research project in innumerable ways, and I am grateful to all of them. I should like, first of all, to thank the Provost Strategic Development Fund (PSDF) for its support in funding this PhD, one of the first ever doctoral awards for the UCL Centre for Digital Humanities (UCLDH), and without it I would not have been able to undertake this research. My heartfelt gratitude goes to Professor Melissa Terras, my academic supervisor and an extraordinary mentor and friend, who has been a constant source of inspiration. Not only did Melissa’s understanding of my ideas around this research often exceed my own capability to articulate them, but her advice, support and nit-picking has managed to guide my sporadic thoughts into a scholarly work. Moreover, I consider myself incredibly fortunate to have Professor Claire Warwick as my second supervisor. I would like to thank Claire for her support during the undertaking of this research. I am thankful not only for her shrewd and insightful remarks but also for reminding me to believe in myself when things got too overwhelming. Both Melissa and Claire also gave me the opportunity to learn important research and networking skills during my time on the Linksphere project and throughout my time at UCLDH which proved indispensable when carrying out my own work. Because of both of these fantastic mentors, I have developed the abilities and skills to question myself, my research, and to focus on achieving to the highest standard. My case studies were possible only through the vital support and documentation provided by their host institutions, and I am especially indebted to the individuals within and outside those organisations who gave their time, advice and encouragement. I am grateful to all the museum staff and management at The Grant Museum of Zoology, Imperial War Museum London and Imperial War Museum North who offered information and hospitality while I was conducting my fieldwork and gathering data. At the Grant Museum I owe a particular debt to Jack Ashby, but would also like to thank Mark Carnall for his input and advice. This thesis could not be completed without the assistance of Carolyn Royston and Jeremy Ottenvanger from Imperial War Museums, and to Jane Audas and Tom Grinsted whose good humour and friendship got the Social Interpretation project off the ground. I am especially indebted to the individuals within UCL Centre for Advanced Spatial Analysis who without whom QRator wouldn’t exist. A huge thank you goes to Steve Gray, for being the best developer I know and for sharing my eccentric sense of humour. Additional thanks go to Dr Andy Hudson Smith who provided me with helpful comments for my work as well as an external perspective which proved invaluable. My great tower of strength throughout this research has been my friends and my family, who have given me love, help, and an important sense of perspective. Most of all, I thank my parents whose support and encouragement throughout has been never ending. Their words of wisdom and constant supply of love, support and reassurance has made me who I am today. Finally to my soon to be husband, Matt, whose patience and sacrifices so that I can complete this work have been vast. I would like to dedicate this thesis to him, my biggest critic, best friend, supporter and proof-reader and with whom this whole adventure began. I’ve been posting my personal experiences about the installation of the Digital Frontiers exhibition but here’s the installation process from another perspective. Teaching and Research Curator Nick Booth has blogged his experience of installing the exhibition over on the UCL Museums and Collections Blog. One of my main challenges was that Claire (understandably) wanted to know as much information about the objects as we could provide. Not only when she was choosing her objects, but also for the labels that she has had to write for each one. In most of the Science and Engineering Collections our object records are literally a few lines in the database, and many things (such as the ‘big egg’ from the last exhibition) are completely unrecognised, by me anyway. This meant that while trying to help Claire pin down her ideas and decide how she would interpret them, I was also having to furiously learn about what we had in the collections. This is a very good thing from a curatorial point of view, but did mean I had to answer a lot with ‘let me get back to you’. However I do know an awful lot about light bulbs now! You can read the rest of Nick’s post here. Yesterday as part of the Social Media Knowledge Exchange project, UCLDH hosted a workshop on Social Media and the Museum.It was targeted specifically at doctoral students and early career researchers. The general workshop theme: how Social Media is changing museum practice and visitor experience; and how Social Media can be integrated into museum exhibitions and events. Its not news to most of us that museums are embracing social media and use it as a means to communicate and promote their activities, and also to interact and engage with their visitors. A large number of museums now have a profile on social media sites to post news, promote their exhibitions & events, or disseminate their content; and also to to interact with visitors by starting conversations, debates and organise participatory projects. This in itself is brilliant. But what is less well understood from an academic and a museum professional perspective is the key questions and challenges that are arising out of the use of social media. how do we engage visitors and encourage users of the collections to build an online community? how do we start conversations with visitors in such a way that they feel that it is appropriate for non-experts to contribute? 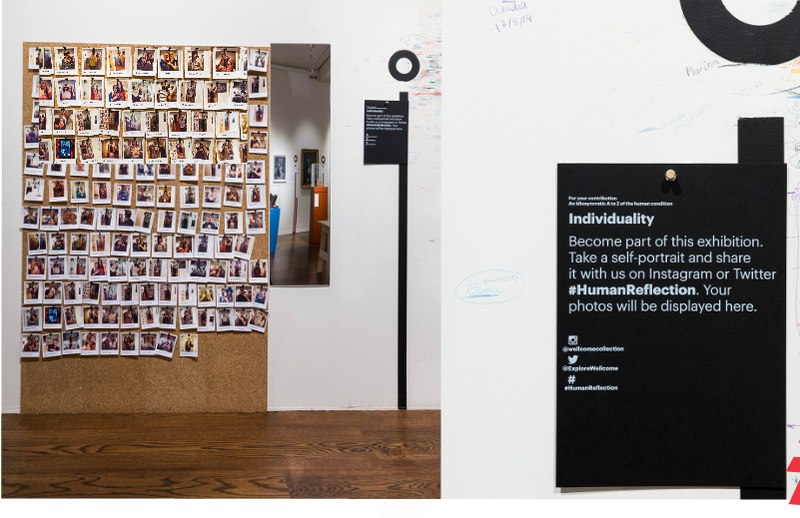 how do we create a feeling of ownership of museum collections amongst the visitors and users? What does this type of social engagement mean for the museum experience? How do we evaluate the impact of social media? These questions came up throughout the day, and naturally more questions came out of that than answers. Claire spoke using social media as a different way to engage people with historical content. The focus of Claire’s talk was around the D-Day as it happens initiative led by Channel 4. Utilising Twitter as a different way of presenting oral history. Suggesting that social media offers a sense of engagement which is very different to reading from history books. Providing a sense of immediacy. The personification of history. Claire highlighted how social media allows contemporary voices to be heard, but it can also bring historical figures and events to life. Throughout her talk interesting questions were raised about physicality, immersive theatre and emotional engagement with historical events and how social media can be involved in all three. In essence are historical figures tweeting in the social media space in the same genre as live interpretation in the museum space? There has been a lot of discussion about what museums can learn from immersive theatre lately. See Seb Chan’s post on Fresh & New(er) of 23 May 2012. “What if we made ‘wonderment’ our Key Performance Indicator?” and Ed Rodley’s post, http://exhibitdev.wordpress.com/2013/01/14/on-immersion-theatre-and-museums/ and Suse Cairns Rethinking why immersive theatre is compelling. It might not be the immersion after all and I think this is something which will need to be explored further. Mark Carnall, curator from the Grant Museum spoke about their strategic use of social media. Mark explained that Social media in the museum is a continually changing landscape and questioned how do/should/could museums manage this evolution. Flickr, YouTube and others – hosting tool. Mark really hit home the need to think strategically. 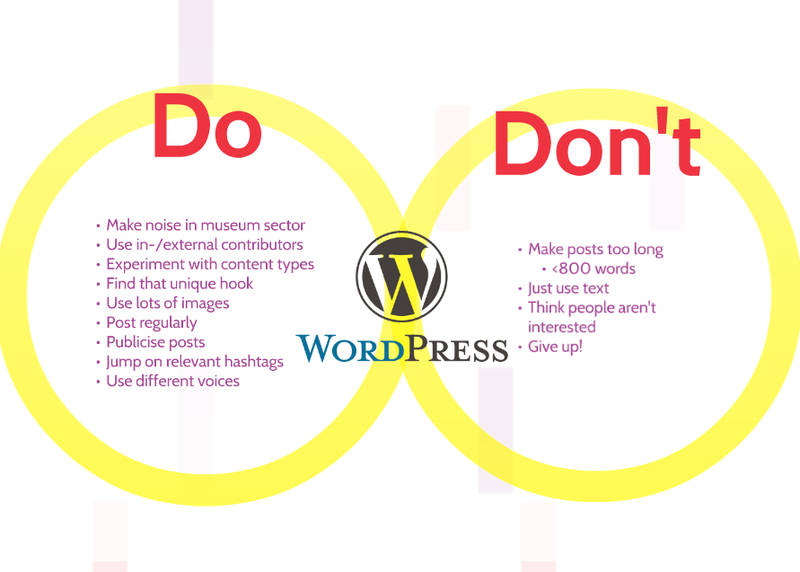 Museums shouldn’t use social media for social medias sake. There is a need to make time to fit social media into working practice. Is there an institutional format you should adopt? What voice will you use? Sustainability: Social media in museums need to be sustainable and you need to be prepared for infrequently of returns because they aren’t always apparent instantly. Mark also shared this brilliant infographic from informationisbeautiful.net: Hierarchy of digital distractions. Alex Smith from Islington Museum gave a great example of how small museums can blog, tweet and use social media as a knowledge experience with limited time and budget highlighting the benefits as well as the reasons why small museums show become involved in social media activities. Alex started by highlighting that the Islington Museum is constrained by council ICT strategy/guidelines and how council museums have to think outside the box to deal with this adequately. Ellie Miles and Larua Lannin from the Museum of London, gave a really interesting talk about the citizen curators project and what they have discovered about trying to collect social media as a museum object. 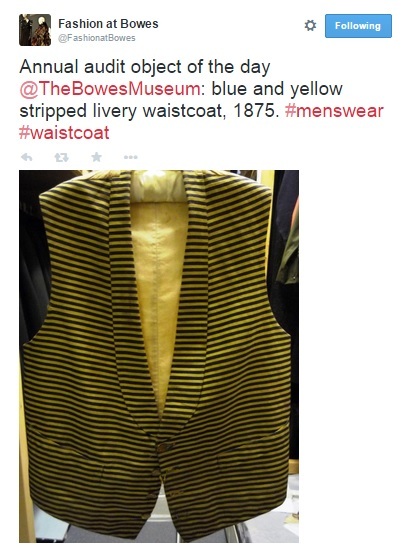 I attended an event at the Museum of London about collecting social media earlier in the year (My post on the Museum of London social media event: can a museum collect tweets & should it? ) so it was great to continue the conversation. The Museum of London’s main aim is to be a contemporary collector of objects, events and ideas from and about the city of London, and because of this contemporary collecting policy they began to think about digital capture of events in London quite early on. They now have the experimental role of a digital curator which aims to develop fresh ways of collecting contemporary digital culture. 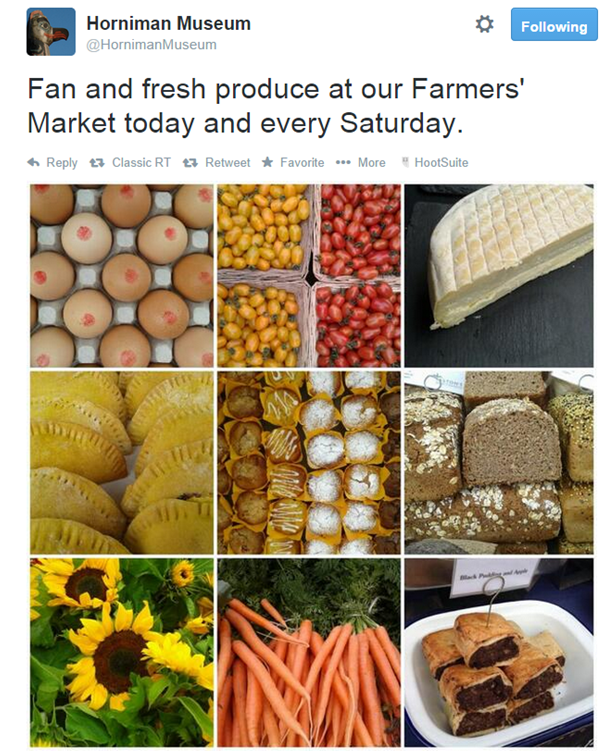 How do museums create interesting social media content? Who decides what is appropriate? How seriously does the institution take social media channels – who are the advocates and for what? Do you have institutional buy in? Impact of social media in museums. can you measure interactions? Is the engagement meaningful? Are stats enough? Multi-vocality. Everyone can have a voice. How do you deal with that? Does anyone in your organisation already have useful social media skills, can you utilise them? Dan then went on to discuss consuming social media as code and gave some really useful ways that utilising the right code can make archiving and optimising social media a piece of cake. Check out Dan’s google drive presentation for some great info on how to consume and produce social media using some simple coding. The rest of the Social Media and the Museum session was a bit more hands on. We went to see Jeremy Bentham and discussed Transcribe Bentham and the The Bentham Pop-up, which waspowered by QRator, and posed a set of Bentham-esq questions to visitors. From there we went to have a look at my Digital Frontiers exhibition and asked question about the challenges and benefits of utilising all digital interpretation and social media inside a museum space. Finally Mark Carnall led a great social media challenge and asked us to work in teams to come up with how we would respond to different social media comments from the public. It really hit home some of the issues you have to think about when dealing with social media responses. A really great day full of interesting discussions.